Winslow Myers was born in New York City. He attended Princeton University, Boston University, and Queens College. From 1974 to 2004 he was chair of the art department at Bancroft School in Worcester, Massachusetts, and taught summer courses at the Rhode Island School of Design. He is represented by Yvette Torres Fine Art in Rockland. Myers is currently writing a book about Walter Murch, which will be published in 2016. Wade Zahares grew up in Kennebunk and now lives and works in Lyman. He has been a full-time professional artist since graduating from Baltimore’s Maryland Institute College of Art. He began his career by creating art commissioned by corporate clients, including Bank of America, HBO, and Cinemax. 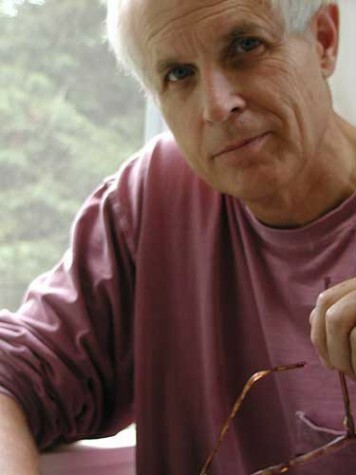 He has published six children’s picture books since 1998. 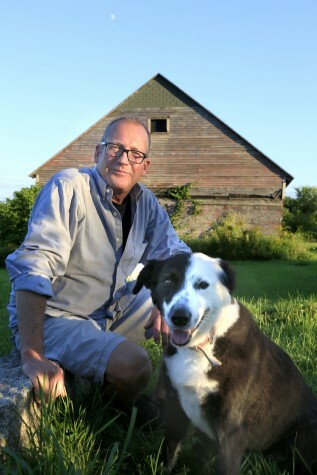 Zahares regularly gives lectures and teaches workshops, and his art can be seen at Maine Art Gallery in Kennebunk, Scott Bundy Gallery in Kennebunkport, and at his Lyman studio. Winslow Myers, Wade Zahares, and Greta Van Campen have built urban visions on the edge of realism and abstraction. 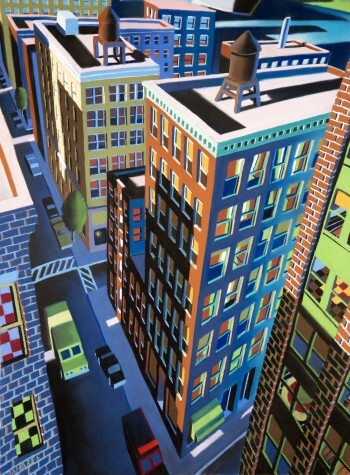 Employing a variety of techniques, these artists depict familiar cityscapes in unique ways. About 10 years ago Myers began a series of split images he calls Passage. “Passage is a multivalent word that might refer to voyages, or a fragment of Bach or Bob Dylan listened to while working, or even a felicitous section of a painting,” he explains. He started working in the split format in order to explore how disparate subjects could come together in compositional harmony through certain visual or symbolic relationships. His intuitive creative process begins with small studies, transitioning to larger studies “until everything falls into place,” Myers says. The Passage series represents “blended distillation” of inspirations, “always with the assumption that there is a vein of poetry to be mined in abandoning abstract and representational as distinct categories,” he explains. Passages #19 demonstrates that fluid boundary between abstraction and reality. 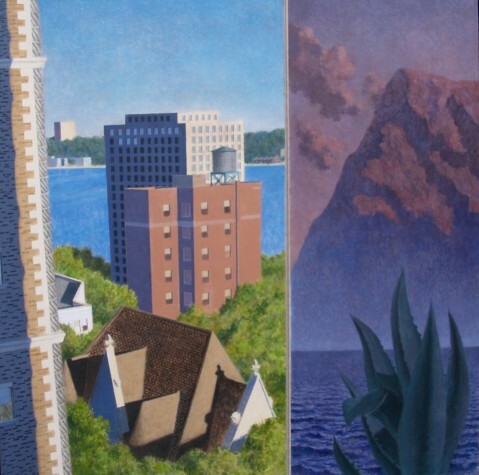 On the left side is a “loose take on the Hudson River seen from the Upper West Side of Manhattan,” and on the right side is a landscape inspired by a windsurfing trip Myers took in Baja, California. The scenes depicted in Passages #19 are based on real locations, but they have a surreal quality. The buildings of Manhattan are seemingly engulfed by trees, while a monolithic mountain rises up out of the ocean, an incongruous plant in the foreground. Myers quotes the Italian painter Giorgio Morandi, who said, “There is nothing more abstract than reality.” Through his art, Myers offers alternative ways of perceiving our surroundings. His unique compositions prove that even the ordinary holds the promise of discovery. Despite the medium’s challenging aspects, Zahares is attracted to “the intimacy, the immediacy, the simplicity, the flatness and the velvety color, and the workability” of pastels. The spirited colors and whimsical details of Zahares’s work belie his impressive discipline and work ethic. Working for six to eight hours at a time, he builds up each piece with a finely honed process that has evolved over time. “When I was younger, I would have a plan in my head, no preliminary drawings,” he recalls. He would map out his ideas on paper, but without a clear vision of the outcome, Zahares became frustrated by “hours of bad decision making being erased because I was unhappy with the outcome,” he says. His desire for a more efficient process coincided with his foray into illustrating children’s books. With publishers “pushing for tighter sketches,” Zahares realized that “tight pencil roughs on inexpensive drawing paper was the answer.” When the composition is finalized, Zahares blocks in basic color with pastels and adds shading, using his finger to blend the color. Finally, he sprays each piece with fixative and lays on a second coat of pastels for a crisp finish and deep saturation of color. “I love creating a whole little world that doesn’t exist in everyday life,” Zahares says. One of the ways he achieves this is through perspective. His work shows his unique vision of the world, as if viewed through a fish-eye lens from vertiginous heights or extreme close-ups. “I remember my first art class in fifth grade where I was so intrigued with perspective and how it works,” Zahares recalls. “I love to manipulate perspective, to play with it and twist it as far as I can where it doesn’t even make sense but the viewer believes it.” My Favorite Water Tower, inspired by one of his favorite places, New York City, depicts the metropolis in signature Zahares style. Tightly packed buildings have a three-dimensional quality thanks to the slightly off-kilter aerial perspective, and the subtle checkerboard patterns peppered throughout give a wink to the city’s iconic taxicabs. Adding to the fanciful feeling are colors more appropriate for a box of crayons than an urban scene. “Growing up with two artists as parents definitely influenced me a great deal,” says Van Campen, whose mother, Susan, is a painter, and father, Tim, is an artist and designer. “When I was really young and my sister was at school, I would bounce around between their studios,” she recalls. “Sometimes they would set me up with whatever materials were on hand, or I’d just sit and watch them work.” Naturally, she was inspired to study and practice art, first with a focus on oil painting. To her own surprise, however, she found that acrylic paint suited her developing style. “I never thought I’d become an acrylic painter,” admits Van Campen, who “never really liked the way acrylics handled.” But her interest in collages led her to realize “that the way to create paintings that read more like the collages was to work in acrylic,” she explains. The fast-drying medium fits her hard-edged, geometric style, allowing her to build up multiple layers of paint. 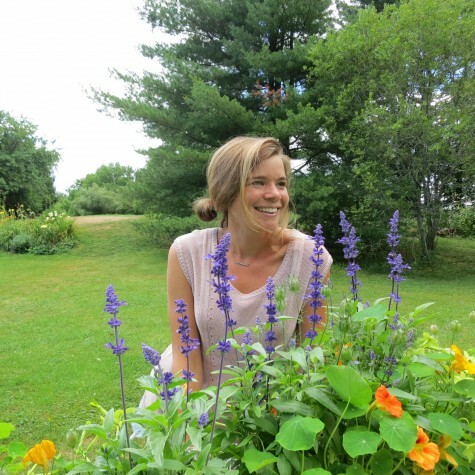 Van Campen finds inspiration in the outdoors, Maine, and her travels. She takes photographs of places or scenes that pique her interest, transforming that inspiration into abstracted imagery. She aims to “recreate a version of the natural, atmospheric world by turning it into a more geometric, color- and balance-driven scene.” Van Campen has a knack for paring down her subjects to their essential elements, achieving a strong sense of ambience that is not muddied by extraneous details. Back Alley, Lincoln Square depicts a specific area in Chicago that is special to Van Campen. 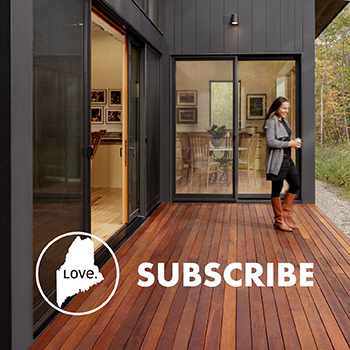 She lived in the Lincoln Square neighborhood for a few years, before returning to Maine in 2010. “I miss the city sometimes, especially all the shapes and lines in between rows of apartment buildings and houses,” she says. 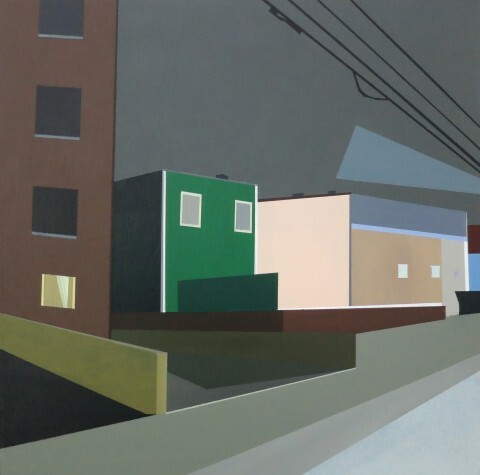 “I loved walking around and looking down every alley.” In Back Alley, Lincoln Square the eye is immediately drawn to the bright green building in the center of the piece, a striking contrast to gray concrete and dark bricks. The angle of the street below and the power lines above converge at the right side of the painting, drawing the eye from the central focal point outward. It makes for a balanced composition, and lends order to the characteristically urban jumble of structures.